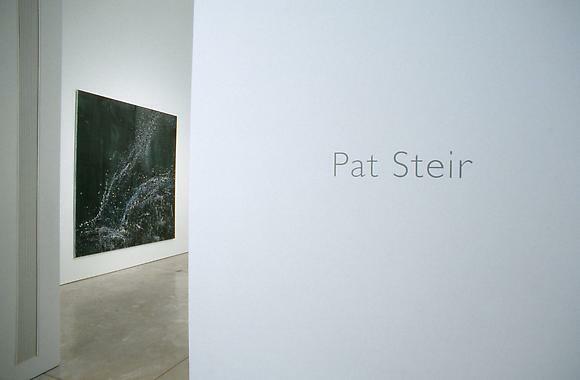 Born in 1940, Pat Steir had her first one-person exhibition at the Terry Dintenfass Gallery in New York in 1964 and has been showing nationally and internationally since that time including participation in several Whitney Biennials, Venice Biennales and Documenta IX. Among postwar American artists, Pat Steir is the painter who has most thoroughly investigated, as well as radically redefined, the different modes possible in painting. Rather than using painting to both establish and articulate a set of bracing limits, which acknowledges a singular historical legacy, as did the Minimalists, or jettisoning painting because it is no longer seen as a valid means of production, as did the Conceptualists, Steir repeatedly defines a set of limited possibilities in order to both move through and beyond them. Thus, she utilizes limitations to focus her attention on a particular set of painting issues, ranging from the relationship between style and subject to, more recently, the relationship between gesture and image. One reason Steir stands apart from her contemporaries is because she has defined a very different goal than her Minimalist and Conceptualist counterparts, most of whom are male. Cognizant of the marginal position women have been assigned in any summary of the history of painting, Steir wants to challenge, as well as undermine, the very notion of a singular historical legacy. Consequently, over the course of a career in which she has deliberately changed the very way she has applied the paint, Steir has gone from simultaneously interpreting found images and styles to exploring the connection between paint's liquidity and its capacity to yield an image. The consequence of these changes is that Steir has subverted, revealed, and reinvented the presumptions thought to be inherent in the very act of painting. At the same time, while it is clear that she has learned from both her Minimalist and Conceptualist counterparts, her interrogation of painting is clearly pitched toward a very different goal than those who seek to arrive at either a pure painting, an essentialist work of art, or a declaration that painting is dead. Instead, her work arises out of an imaginative revisioning of the materials and processes associated with paint and painting. A publication with a text by Linda Yablonsky accompanies the exhibition.